"I found Chris Hare’s book “Sensational Memory” invaluable for memorising a great deal of my material for shows. I found it particularly useful for memorising the scripts when appearing in BBC’s Eastenders. I’ve been amazed several times by watching Chris Hare’s Memory performances but having read his book I was most surprised at how easy it was to apply the techniques and to put them to good use". Bobby Davro – Comedian, actor and TV personality. 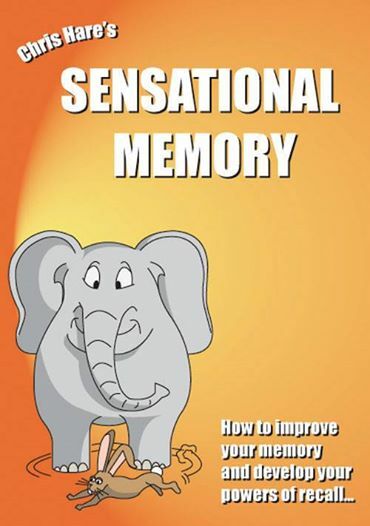 "Sensational Memory has been a big hit in our house. Written in such a user friendly manner has made it simple to try out Chris Hare's techniques particularly for my three children ranging from 12 to 18 years old. They have even put them to good use with their exam revision!! "I have studied memory and mnemonic techniques on and off for several years and I have to say that Sensational Memory is one of the best all round guides I have read. The book is very easy to read and understand and goes through a lot of practical examples to get you started, the section on memorising prose is particularly strong and not something I have seen in any of the other books I have read. I used techniques from Chris Hare's book when studying for exams recently and managed to get a distinction in my MSc, so I can say that the book is practical as well as entertaining!" The Sensational Memory Show presented by Chris Hare the author of Sensational Memory. The show is designed to help students get the most out of revision by making the Magic of the Mind work for them and 'Making Learning Fun'. The Sensational Memory Show gives The Golden Key to open many Golden Gateways. Chris Hare is a professional Memoryman who has performed countless times in the glare of large public audiences and TV cameras. He has travelled all over the world and on more than one occasion memorised the birthdays of over 300 cruise ship passengers. Pupils and staff are treated to some amazing demonstrations of memory at the opening of The Sensational Memory Show. However, this show is not about one man performing fantastic feats of memory. It’s about audience members learning a skill set for life in a very short space of time. Within minutes the audience begin to realise how powerful their memory is. Chris Hare is also the author of Sensational Memory. His book gives an in depth insight into how the human memory works and teaches people how to apply simple yet highly effective techniques for absorbing information and acquiring instant recall. Surprisingly, these powerful techniques can be acquired in a very short space of time. They are taught with a great deal of fun and audience interactivity. Humour is used almost throughout The Sensational Memory Show but the humour is not to be considered in any way frivolous, as it is strategically placed to make any key points most memorable for future use. Acquiring a new skill and insight is a pleasurable experience which breeds confidence. It is much easier to learn when you have confidence. Knowing that you have acquired such a skill makes learning a less daunting task. In fact, it makes learning a most pleasurable experience. The simple yet highly effective techniques taught in The Sensational Memory Show encourage and enhance creative thinking. The show teaches an alternative and fun way of studying and problem solving. To ensure the entire audience is kept intrigued and entertained throughout Chris Hare also performs some of his astonishing Mind Reading feats such as guessing someone’s birthday or naming a celebrity that someone has randomly but secretly thought of. The Sensational Memory Show is a most enjoyable and unforgettable experiences after which students get to keep a Golden Key which opens many Golden Gateways. Chris is supporting us with 5 FREE shows Book Now.